The new Twitter app for BlackBerry PlayBook is now on the market and it comes with an impressive Ul. Not to mention that it is simple to add both Tweet Book and Twitter and toggle between the two accounts. One feature that really makes me happy is the apps ability to automatically open the page inside the app when you open a tweet that has a web link. It will appear that you are reading a bridged email application. 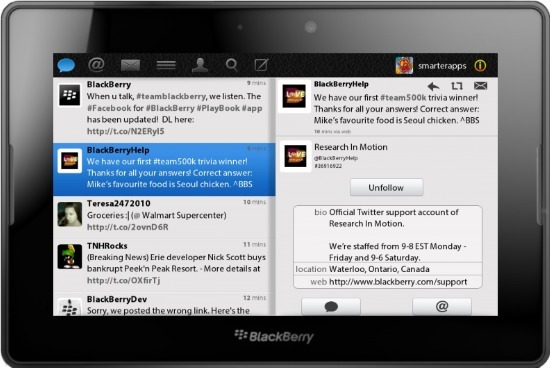 TweetBook is designed to feel and function as a native Twitter® application for the BlackBerry® PlayBook™. This provides the user with a high quality, full-featured Twitter® experience: search, browse, send images, messages, follow your interests and friends while tweeting to your heart’s content on Twitter® with ease and simplicity. TweetBook manages all of Twitter®’s content within sleek, rich graphics and multi-pane windows, supports multiple accounts, and receiving notifications on your PlayBook™ home screen will keep you on top of your friends, mentions and interests. TweetBook also takes advantage of the BlackBerry® PlayBook™’s built-in camera, allowing you to directly take and upload images to your tweets – it couldn’t be simpler! Twitter enthusiasts rejoice, TweetBook and BlackBerry® PlayBook™ are just meant for each other!